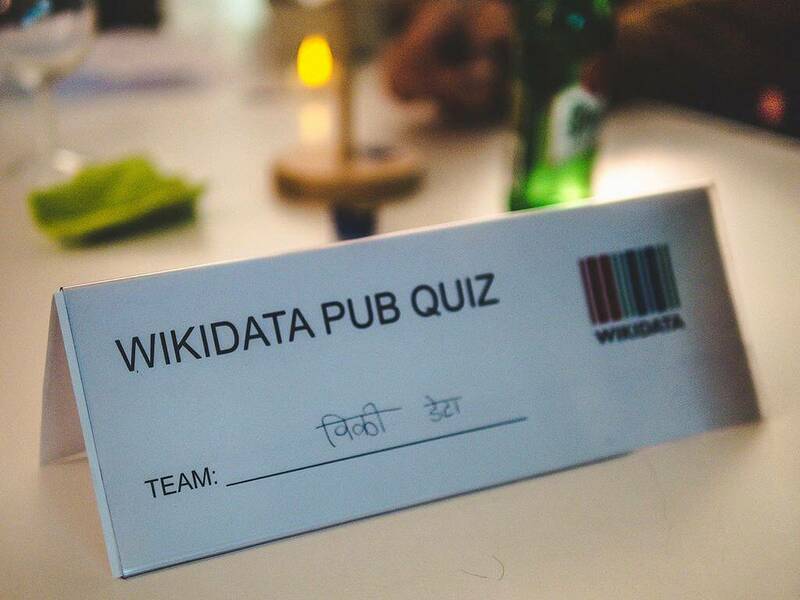 Pub Quiz – a phenomenon that is even popular at the Wikipedia conference, as shown in our title image. However, it’s even more usual at pubs and bars. You meet up some friends in the evening and play against other teams with your shared knowledge. There are questions from fields like geography, politics, history, and biology, as well as specialized knowledge, current events and nerdy stuff – in the most positive sense there can be. We have prepared an overview for each day of the week – last updated January 2018. In all of Vienna’s districts there are more than 45 locations organizing regular pub quiz nights. You can play a pub quiz in Vienna on each day of the week. Before we present our overview, we’d like to share with you our personal Top 3 of pub quiz locations in Vienna. In these bars it is important to make a reservation since quiz nights are often extremely busy. The order of our Top 3 is random and is built on our personal taste. By the way: Many bars with quiz nights are also a great place for board game nights or a location to go to at the end of a hen or stag night in Vienna. If you prefer Room Escape or other Unusual Indoor Activities in Vienna you’ll find everything you need at Crime Runners. Crime Runners is the leading location for Escape Rooms in Vienna on Trip Advisor. In our Vienna Tourist Guide we regularly offer new tips on locations, events and spare time activities in town like Vienna’s cool bars with the best drinks. Every Thursday there is a Pub Quiz at Shebeen on Lerchenfelderstraße. You get there by taking the tram 13A to the station Lerchenfelder / Strozzigasse. It is also busy on other days of the week and best known for great burgers. The international pub is famous for its authentic flair, the barkeepers and service staff welcome you in English. The prices for drinks are average for Vienna and there’s a broad range of drinks. You’ll often meet regular teams on the quiz nights, questions and categories are thought through and the atmosphere is great. Club Berlin offers a great atmosphere at its regular Thursday night pub quiz. There’s a jackpot rule, monthly and yearly high scores as well as drink vouchers that attract a versatile group of regulars. The quiz itself is split in two parts (General Knowledge and Music) with prizes for each part. A jackpot of more than 200 Euro can be won in both parts. The name Club Berlin fits the location perfectly. On the ground floor there’s the bar, bistro tables and a few seats. Exciting is the way downstairs towards the masonry basement. There you’ll find three more rooms with lots of space, table football, seats and club area. Everything is a little old, just like usually in Berlin, and thus the location has its very special charm. If you’re hungry you can order convenient snacks, like bread loafs with feta cheese or topped brown bread. The list of drinks offers a very broad range and the prices are low considering the location in the heart of the city. It is not only the name that lures quiz experts to the place called Spielbar in the 8th District. Beside of quiz night on Tuesdays it’s also busy on other nights of the week. On Wednesday, for example, there’ regular Bingo of Drinks, on Sunday there’s the Howling of Werewolves and every day there are 100 board games for game night that can be borrowed for free. For all those who like a bit of motion, there’s table football and darts. The bar itself is way smaller than locations like Shebeen or Club Berlin, which means that evenings are a little more quiet in here. The service staff is extremely friendly and it’s all about playing games. The prices are average. If you get hungry you can buy toasts, salads, burritos and tortilla pizza. The best size for groups is between four and six players. You eat, drink and play various rounds of different quiz topics. In the end the team with most points wins. The exact rules depend on the bar and may vary from location to location. In many locations the winners get free drinks or gift prizes. Some bars offer a monthly, quarterly, etc. high score. In some locations there are jackpots the night’s winning team gets to play for. In this case there’s money to win. If the pub quiz is not for free or something else is unusual about a location, there’s information on it in our overview. Please note that many pub quiz bars have summer breaks between June and September. Especially in pubs, the group activity can be played in English and German. We recommend to ring the location and ask for the next quiz night’s language, since the language specifications may vary from time to time. One of the most prominent organizer for quiz nights in Vienna is Quizmanufaktur, a company that is in charge of quizzes in more than 10 locations. Our personal tip for a pub quiz on Monday is Café Benno in the 8th District. There’s a second regular pub quiz on Tuesday, drinks are convenient, the atmosphere nice and Café Benno is also known as a Game Bar. We recommend to make a reservation since quiz nights are always busy. Please note that the quizzes at The Wild Geese and LOOP don’t take place each Monday. Check the locations’ Websites or Facebook pages to make sure there is a pub quiz. Billabong Pub 1010 U3 Stubentor 20.30 2€ / P.
Golden Harp 1080 5/33 Florianigasse 19.00 3€ / P.
SAXX 1090 U6 Währinger Straße 20.00 2€ / P.
Our personal pub quiz tip for Tuesday is Spielbar with its broad selection of board games and other game nights like Wednesday Bingo. A location we also recommend is Johnny’s Pub in the 4th District, an original English Pub with British Flair that is different from many Irish Pubs in the city. Please note that the pub quiz at Rupp’s does not take place each Tuesday. Check the locations’ Website or Facebook page to make sure there is a pub quiz. Our tip for Wednesday is the Pub Quiz at Na-nÓg close to Nußdorferstraße. The location is an Irish Pub calling itself second living room, and it lives up to this standard. The atmosphere is open and relaxed, the service staff friendly. Please note that the quizzes at Apothek’n and Café Stadtbahn don’t take place every Wednesday and the quiz at Polkadot on a non-regular basis. Check the locations’ Website or Facebook page to make sure there is a pub quiz. For Thursday we don’t have one personal tip for you, but three! The locations are Escape Metal Corner in the 7th District, Down Under in the 6th District and Shebeen. As you might have concluded by the name Corner is a Heavy Metal bar, where you can also go to see concerts. Most convenient at the Corner is Jack & Coke, in general the prices are affordable for students. Down Under is an Australian pub that is comfortable but quite noisy. If you are planning to play here you should make a reservation. What makes Shebeen special is the large number of regular teams and the quality of the quizzes. Please note that the quizzes at Escape Metal Corner, Tunnel Vienna and Café Lassa don’t take place each Thursday. Check the locations’ Website or Facebook page to make sure there is a pub quiz. Our pub quiz tips for Friday: Schwarzer Rabe in Ottakring and Bebop. The pub quiz tradition at Rabenbräu already began in 2004. Special for both locations is the music quiz that takes place at the same time as the regular pub quiz, in which you have to guess songs. At Rabenbräu you have the additional chance to win the prize for funniest answer. While other pub quiz nights also include questions about music, the music themed quizzes at these two locations are – as far as we know – unique. There are lots of other events in Vienna each Saturday. This may be one reason why we only know of one non-regular pub quiz that takes place on each last Saturday of a month at Café Gitarre. This quiz is music themed and is called Musical Heart Massage. For Sunday our recommendation is Charlie P’s, a pub that is especially popular among students since it’s located close to University. Upstairs you can spend a quiet evening and eat, downstairs in the basement there’s room for parties. Around the corner you also find Highlander Pub with its own pub quiz on Sunday. Please note that the quizzes at Kleinbonum, Café Gitarre, Little Stage, and Bastille Pub don’t take place each weekend. Check the locations’ Website or Facebook page to make sure there is a pub quiz. Dublin Irish Pub 1060 U4 Pilgramgasse 19.00 2€ / P.
With all these possibilities it’s not easy to choose. We hope that our daily pub quiz tips, the overview and station tips help you to make your decision. Enjoy solving riddles at your next pub quiz night in Vienna. If you also like riddles with special effects, adrenalin, motion and storytelling, we are happy to welcome you at Crime Runners. Crime Runners is Escape the Room 3.0 directly at Schottentor.